Information-Driven Business helps you to understand this change and find the value in your data. Hillard explains techniques that organizations can use and how business can apply them immediately. For example, simple changes to the way data is described will let staff support their customers much more quickly and two simple measures let executives know whether they will be able to use the content of a database before it is even built. This book provides the foundation on which analytical and data rich organizations can be created. Robert Hillard is a Partner with Deloitte in Australia. He has written and spoken extensively on Information Management topics and sponsored the creation of the MIKE2.0 standard approach. Information-Driven Business has received great coverage in the media. You can buy Information-Driven busienss from all major booksellers including Amazon. "Robert Hillard gets it! The sheer quantity of information that is descending upon our organizations means that we can’t just “wing it” when it comes to managing information. The strategic imperative to manage information effectively is now irreversible - with devastating consequences for those who assume it is otherwise. The book provides you with a thorough understanding of how to find, control, and optimize YOUR information assets." "Information-Driven Business takes a highly complex subject like information theory and makes it far more accessible for the general reader. It is truly a call to action for an effective transition to the new information economy. If you are a student preparing to join the workforce, a seasoned information management professional or an executive looking to make your business thrive through better information, you'll benefit from Hillard's innovative thinking and pragmatic recommendations." "The book brilliantly combines a broad historical view of information management foundations with cutting edge nowadays advances in Information Governance including the notion of Economic Value of Information the author pioneered. Information governance metrics - what are they? The book provides some unique answers to this very important question. 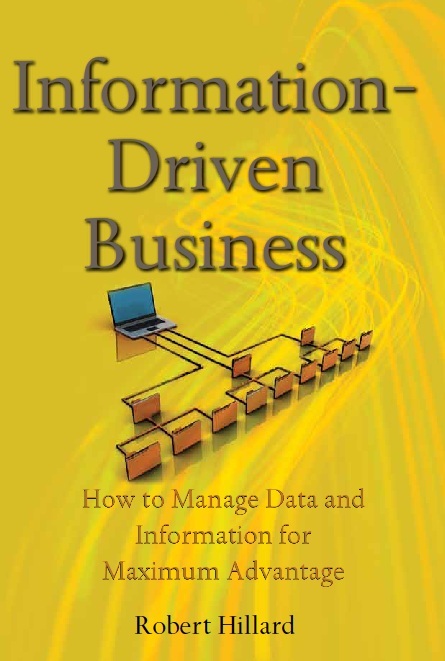 Great book for business executives, information technology professionals and others who want to better understand the role of information in our society and for the corporate world".